The iconic 1968 film ‘Bullitt’ with Steve McQueen is best known for its Mustang car-chase through the streets of San Francisco. For the Mustang faithful, it is considered genesis of high-performance Mustangs through the years. To celebrate that genesis and the 50th anniversary of the movie, Ford created and introduced a Bullitt Special Edition at the 2018 North American International Auto Show. It was a very special introduction as it included a third generation McQueen, Molly and the original Mustang (there were two) that was driven by Steve McQueen in the film. 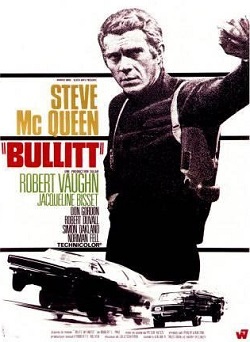 When the film ‘Bullitt’ debuted on October, 1968, I owned a Mustang. A 1968 Fastback in Lime Gold powered by the 302 V8 with automatic transmission. After seeing the film, I often imagined myself driving my Mustang as ably as McQueen did his. My 1968 302 was not quite up to the task. So, I added the imagined thought to my – now somewhat crusty – bucket list thinking, ‘you never know’. My 1968 Mustang is long gone. 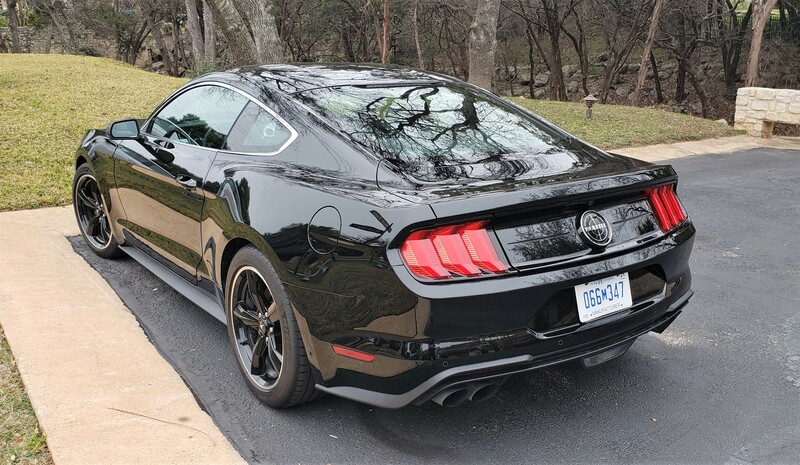 So, when Ford delivered us a 2019 Mustang Bullitt a week ago, I was eager to ease into the seat, turn it over, surrender my soul to the throaty rumble of the 5.0L V8, shift into gear and head out onto highway 71. Finally – able to check that old item off the list. It was not to be. Having taken a tumble off a retaining wall the day before – my right arm, ribs and elbow were all but immobilized making it near impossible to operate the shifter. 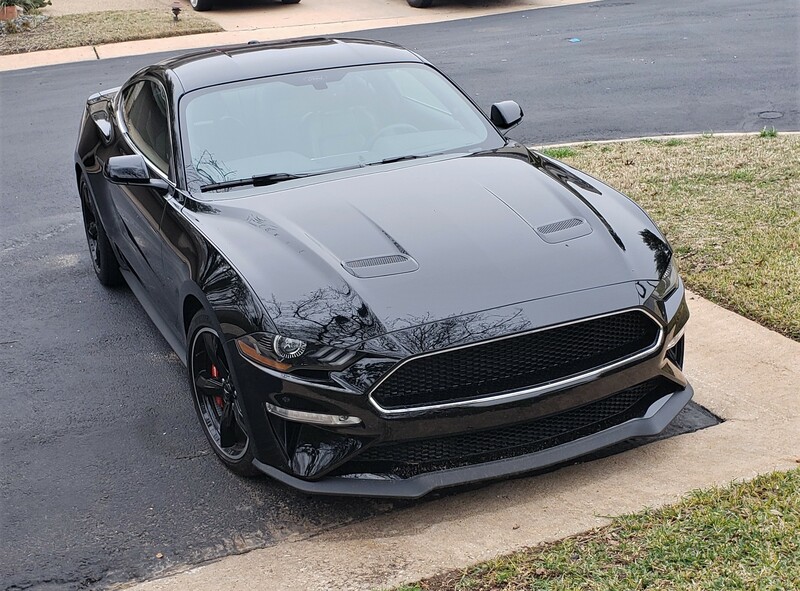 For the next seven days the Shadow Black Bullitt Mustang sat in my driveway waiting to rumble. Each morning I got up hoping for enough mobility to get behind the wheel and go. Neither of us was satisfied. As I write this, my friends from Ford are picking up ‘my’ Bullitt Mustang and moving it along to another journalist. They did promise to bring it back though, when my shifting arm is ready. The 2019 Bullitt Special Edition fastback coupe comes in two colors, the classic Dark Highland Green as seen in the film and Shadow Black. The interior is black with green contrast stitching on the Dark Highland Green version. Equipped with an aluminum hood, LED headlights and daytime driving lamps, Bullitt sports a blacked-out grille with subtle chrome accents. True to its heritage, it is without badging – except for the ‘Bullitt’ logo on the rear center gas cap. 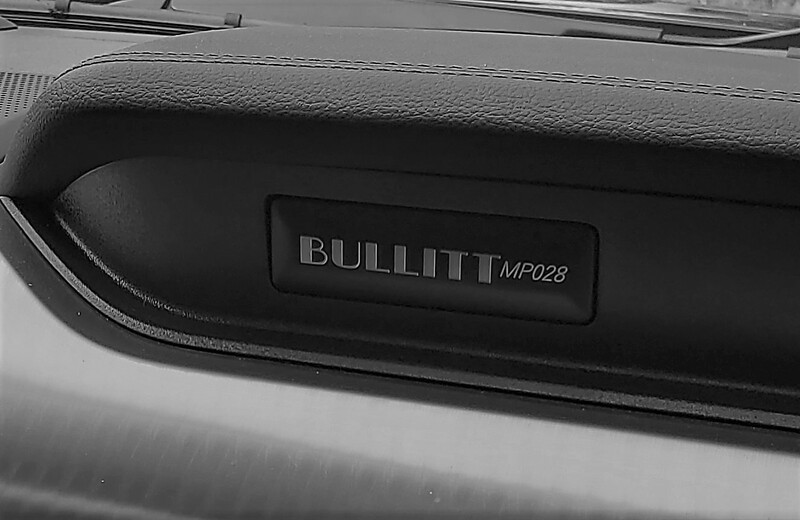 On the inside, Bullitt is equally subtle with the Bullitt logo on the passenger side front dash and nameplates on the door sills. Other features inside are as found on the Mustang GT including the 12-inch all-digital LCD instrument cluster, ambient lighting and more. 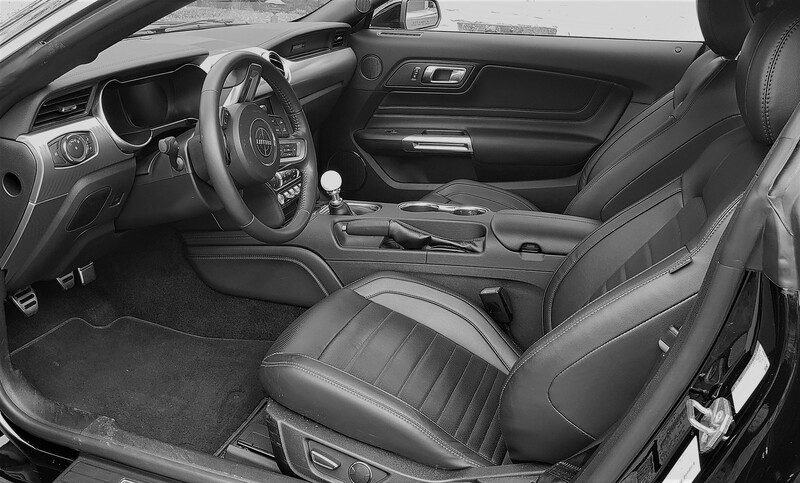 Oh yes, there is one more signature interior feature. True to the original – the white ‘cue’ ball shifter knob. For those of us who grew up with a HURST shifter, looks good and feels good. The front-engine rear-wheel-drive Bullitt is powered by a 5.0L V8 with a Shelby GT350 intake manifold and open-air induction. It punches out 526 horsepower at 7,500 rpm with 429 lb.-ft. of torque at 4,750 rpm. 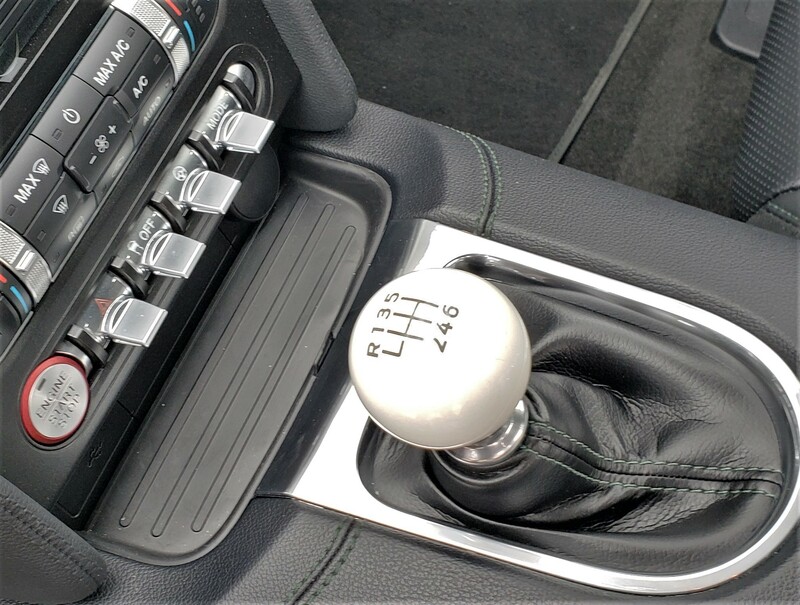 Mated to Ford’s rev-matching TR-3160 six-speed manual transmission and well-integrated with powerplant and clutch – shifting is smooth and powerful. (We know from having driven this combo before). 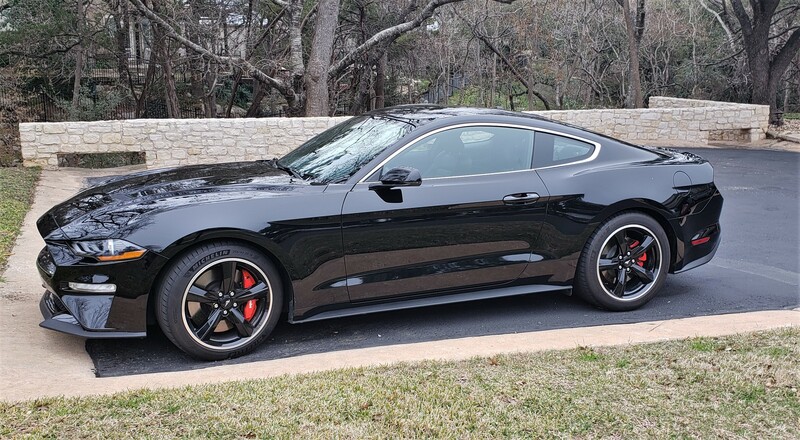 Since you asked – top speed for Bullitt is 163 mph and, if you are driving Bullitt, you do not care what the fuel economy rating is. 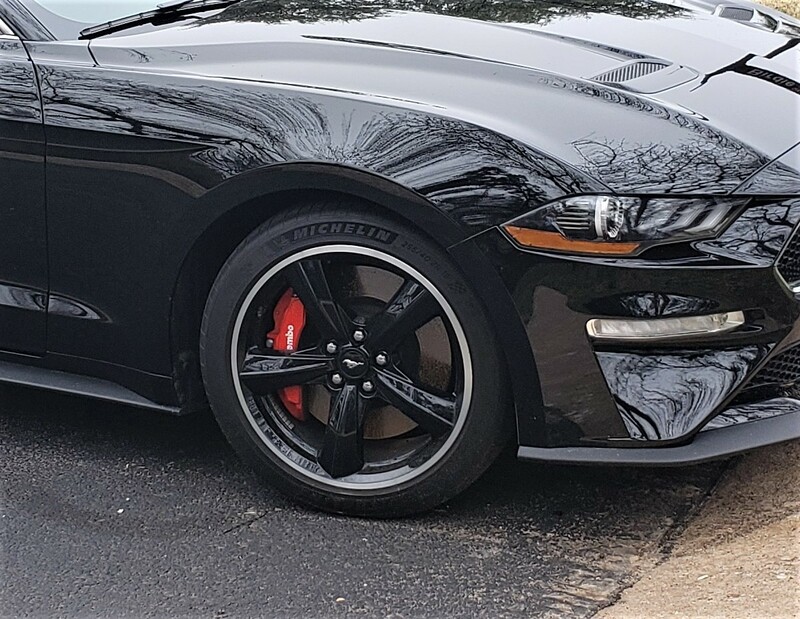 Bullitt runs on 19-inch, Five Spoke Heritage wheels mounted with Michelin Pilot Sport 4S P255/40R19 front and P275/40R19 rear summer only tires. The standard suspension is MacPherson strut and stabilizer bar front and integral-link with coil springs, stabilizer bar and mono-tube dampers rear. Steering is electric power-assist rack and pinion. Braking is four-wheel power with four sensor, four channel antilock disc and AdvanceTrac electronic stability control – featuring Brembo (Red) six-piston calipers front. Bullitt Electronics ($2,100) with B&O Premium 12-Speaker Sound System, Voice Activated Navigation and BLIS with Cross Traffic Alert. Magne-Ride Dampening System ($1,695)– An active suspension system using sensors around the vehicle to adjust suspension based on inputs including speed, steering angle, brake pressure, lateral and longitudinal acceleration and engine torque. Our Bullitt was in the Shadow Black with black leather interior. The MSRP was $46,595. It had the Bullitt Electronics Package and Magne-Ride Damping System. The Recaro Seats were not on our test vehicle. With delivery, our Bullitt Mustang priced at $51,290. If our Bullitt had included the RECARO seats, the price would have been $52,885. Mustang for 2019 comes in four models, two body-styles, two engine choices and a six-speed manual gearbox standard with a 10-speed automatic optional starting at $26,395 for the EcoBoost coupe and topping out at MSRP $59,140 for the Shelby GT350. We tested a 2018 Mustang EcoBoost Premium Coupe for inwheeltime.com earlier this year. We were very surprised at the performance of the 2.3L EcoBoost mated to the 10-speed automatic transmission. Well fitted out, its delivered price was just $42,000. For a lot of folks, a right reasonable alternative to the Bullitt.